Today I have an FO to show you (that is knitspeak for Finished Object). 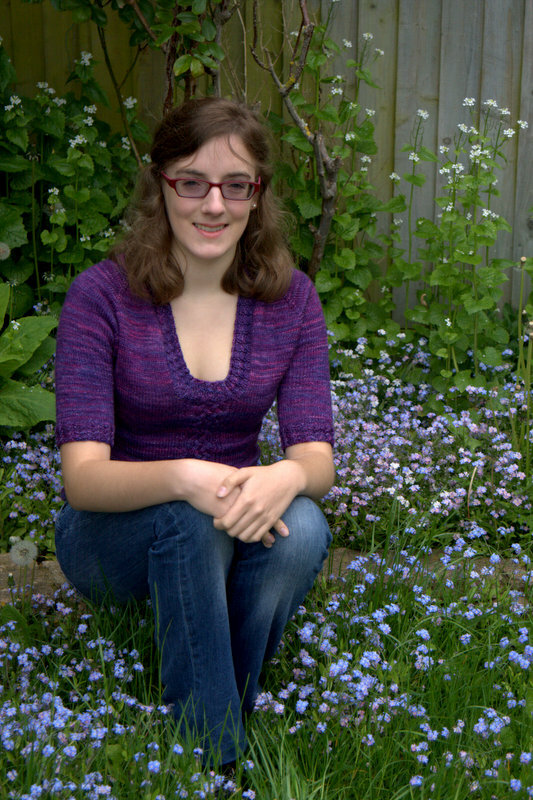 These photos are of my younger daughter Leah wearing her Flash of Purple sweater. 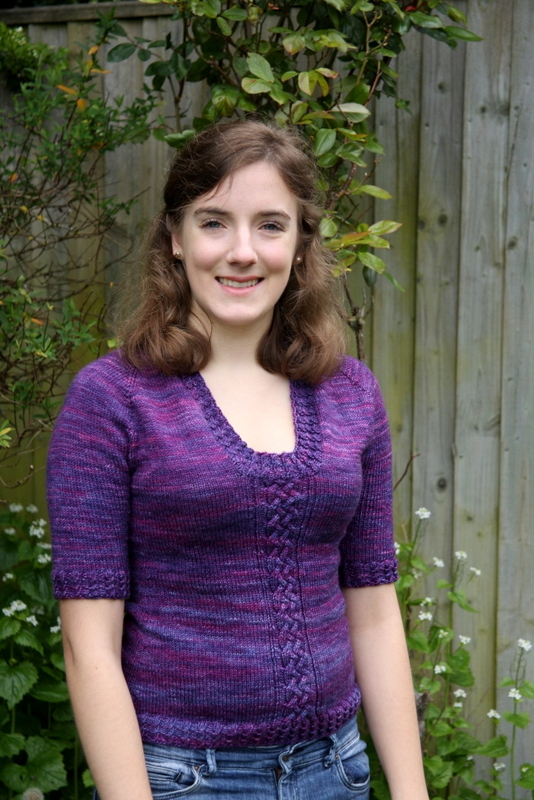 This is a customized version of Wendy Bernard’s pattern for the Backwards Cabled Pullover from her book, Custom Knits. 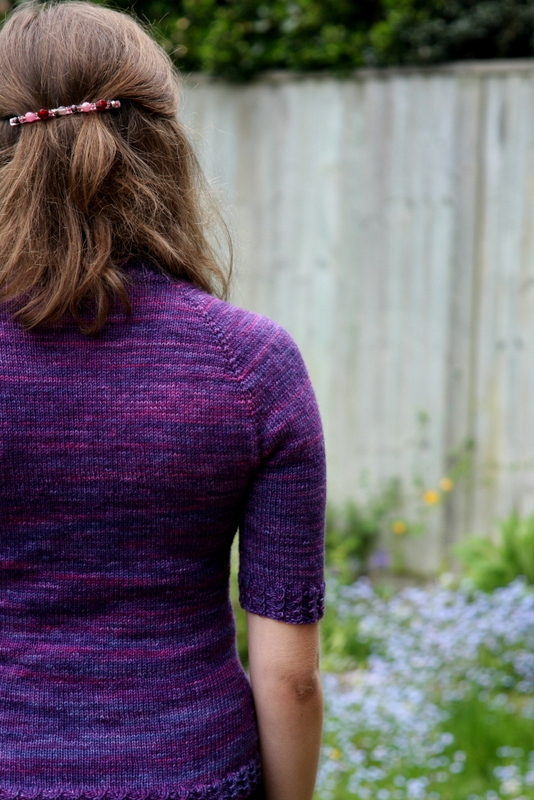 I am really pleased with this sweater, which fits wonderfully and really suits Leah. The best thing about this sweater is that it was a truly collaborative project right from the start. Leah and I spent hours discussing just what kind of sweater she wanted and talking about all of the design features it should have. 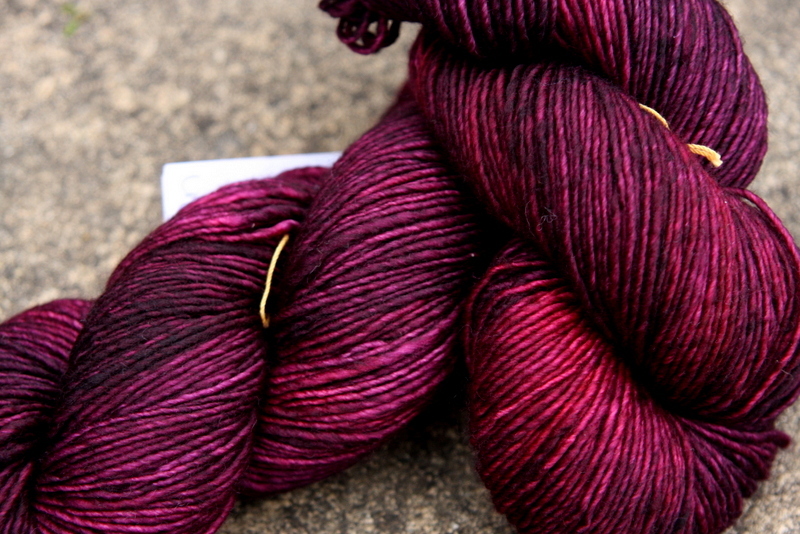 When Leah saw the Madelinetosh Pashmina yarn in this colour, Flashdance, she was sold instantly. 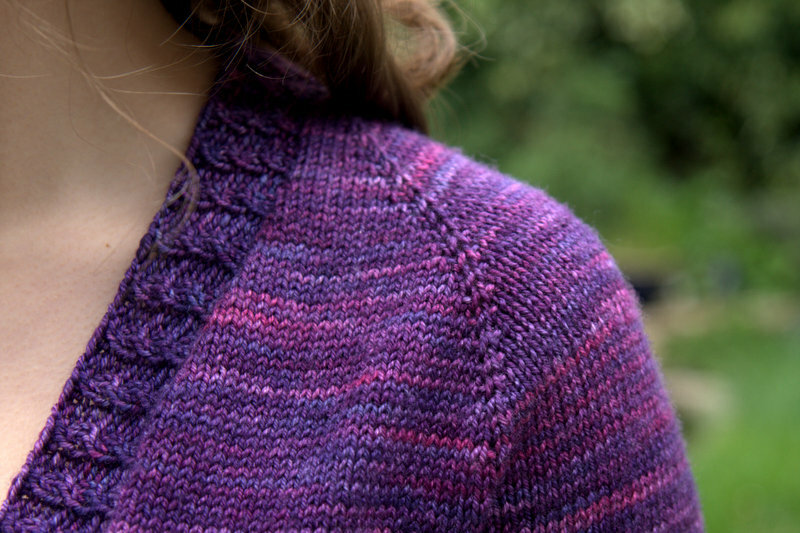 Having narrowed down the yarn, we spent hours trolling Ravelry for just the right pattern. We couldn’t find one that was exactly what we were looking for, but Wendy’s pattern was very close, so we ran with it and modified it as we went. The main modification I made was to turn the sweater back-to-front (the original has a high neckline and plunging back), but I also heavily customized the sizing. The pashmina has a tighter gauge than that specified in the pattern. The standard way around this type of gauge issue is to knit a larger size (say to knit a size 40 to obtain a size 36). To do this properly, one must employ math. Dear reader, math is your friend; it is part of a good knitter’s arsenal of tools. Do not be afraid of math but wade into it willingly and your sweaters will thank you for it. Fair warning – the next two paragraphs will be slightly technical; one is allowed to skip them and just look at the photos. For this pullover, I had two conflicting pressures on the sizing. On the one hand, I was using a thinner yarn, so I needed to have more stitches on the needles (to knit a larger size than required). On the other, we were after a clingy sweater, a 50s sweater girl kind of look. This means that I needed to build in a lot of negative ease. For the uninitiated, ease refers to the fit of your garment. Say that you have a chest measurement of 36″. If your sweater has a chest measurement of 36″, then that sweater is said to have zero ease. If the sweater measures 38″ you have two inches of positive ease and if it measures 34″ you have two inches of negative ease. In order to knit a garment that you are happy with, you have to understand ease, and also know what kind of fit you are aiming for. You also need to know your yarn and your stitch pattern, so that you know how stretchy they are, and how much they will give after washing. This is why it is so important to knit a reasonable sized swatch and to wash it before knitting a garment. For this sweater, the thinner yarn meant I needed to knit a larger size, but the negative ease meant that I needed to knit a smaller size. I ended up doing a completely customized sizing, deciding that in order to get an extra small, I needed to knit something between a small and medium. So, I redid all of the figures, and made sure that Leah tried it on every 2″ or so, just to make sure. This method requires both math and a lot of trial and error. I reported in an earlier post that I had originally made the arm opening too shallow and had to rip out quite a few inches and redo part of the yoke. I also knit 3 sleeves for this pullover. 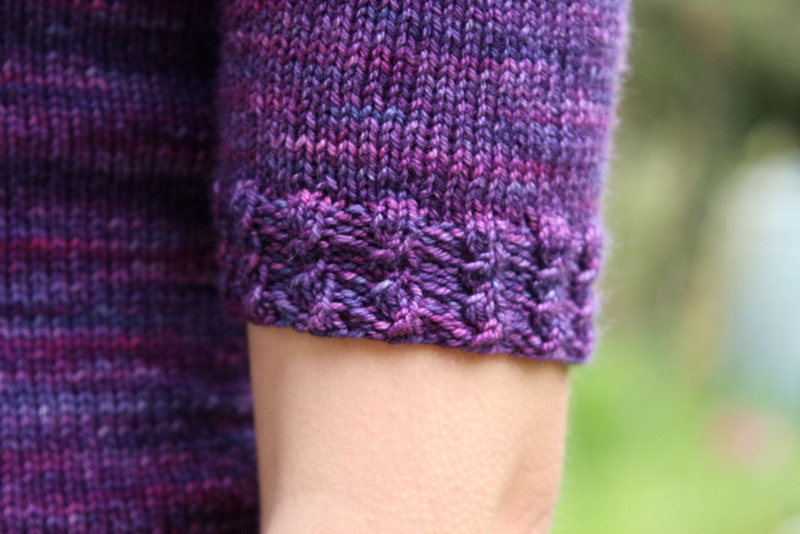 The first sleeve was too tight on Leah, so I ripped it out and knit it again, making fewer decreases (I decreased at rounds 10, 20, 30, and 40 and then knit to 6″ before knitting the cuffs). The finished garment has 4.5″ of negative ease. I would highly recommend this pattern, and indeed the whole book. 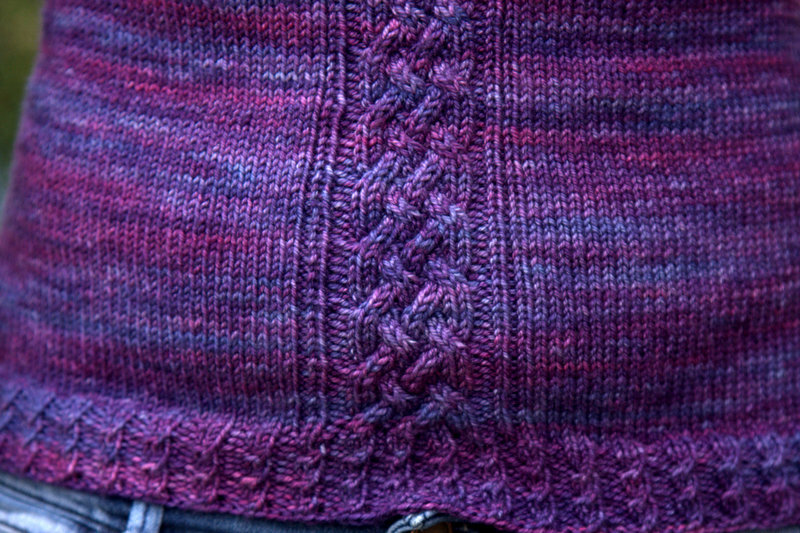 I have previously knit one of the other sweaters from this book, Ingenue, and it is a lovely sweater that gets worn all of the time. Wendy’s whole approach to knitting is to encourage people to customize their knits, and I really like that. She has a brand new book out by the way, Custom Knits Accessories; I haven’t had a chance to look at it yet but I would bet that it’s great. Emma and I went into London yesterday, and spent some time in Loop, a wonderful yarn shop in Islington in the Camden Passage. I had just finished knitting Leah’s sweater and went to Loop armed with a list of seven sweaters that I was considering making for myself and their yarn requirements. Emma saw the above Madelinetosh DK in Venetian and fell in love. It is hard to capture the richness of the colour which is a very deep red with black undertones. I bought a sweater’s worth which is destined for Emma. And the seven sweaters for me? Maybe next time. 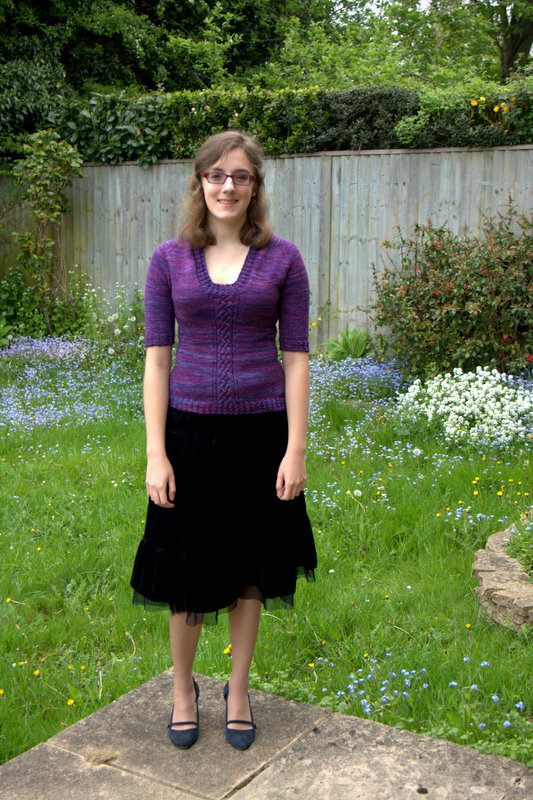 This entry was posted in Finished Project, Main and tagged Backwards Cabled Pullover, Custom Knits, Flash of Purple, Knitting, Madelinetosh Pashmina, Wendy Bernard by knitigatingcircumstances. Bookmark the permalink. The sweater came out great. The colors are beautiful and it fits Leah perfectly. Nice job. Thanks Jossie. I bought the yarn for this online from WEBS; I am envious that you can go there in person. I brought Gillian to Webs a few weeks ago- she is a great little knitter. We had a great time admiring all the colors and soft yarns and then we each bought a few skeins off the $2.00 (but being upped to $2.50) clearance shelves. Their tent sale is in a couple of weeks. I’ve never been but heard people come from all over and load up shopping carts full. That is a bit much for me. Do your girls knit? Next time you are in the northeast, we can go on a field trip to Webs.